The Studio 192 must be connected to a computer host (Mac or PC) in order to operate. Your iPad must be connected to the same wi-fi network and subdomain (ie 192.168.0.x) as your computer. If you require stand alone functionality, consider using the RM16Ai or RM32Ai mixers which do offer this type of functionality. 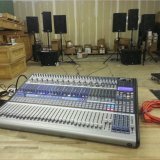 Can I use StudioLive AI mixer and Studio192 on same UC Surface ? Should I be able to control Universal Control running on Windows 10 from an iPad?